The Vineyard Restaurant has been family owned and operated in Bethlehem, PA for over 20 years. Pietro DiMatteo has been the Chef/Owner and his motto has always been to offer the freshest products possible at a great price. There is a special feeling when you sit down in our traditional Italian restaurant. We hope you enjoy your meal and come back to see us very soon! Our Food The food at The Vineyard is made from the freshest ingredients you can buy. Chef Pietro has learned the craft of a butcher from a family of five generations. All the meats are prepared fresh daily at the restaurant and are chemical and preservative free. Love this place ! Come here every time we visit! We are so glad it reopened. It was our go-to place before and we still love it. Good food, great staff! Feel very comfortable and at home there. We would recommend to everyone but we don't want it to get so popular that we cannot get a table. Our dinner and experience was exceptional as always! Our favorite Italian Restaurant! Great food, nice people & terrific servers - we highly recommend it. Menu items are always well-prepared, flavorful and reasonably priced. Amazing food!!!!!!!!!!!!!!!!!!!!!!! If looking for a romantic evening, request a booth or you could be sitting right next to others. But the food here is worth it. Best Italian ever!!!!!!! The food was amazing. Had the mozzarella appetizer... it is a must have! Completely recommend this restaurant to anyone interested in a great authentic Italian meal! Kitchen help obviously needed badly. Two hours seated before we ever received meals. We looked around the Restaurant 1 1/2 hours in and not one single table had dinners in front of them. Very loud, hard to have a conversation. Food was good once we received it, paid and bolted immediately, after finding our server and asking for bill. This used to be one of our favorite places to go. Can’t express how happy we are to have this favorite back! Missed the veal tremendously and the gravy outstanding. Have always loved the saltimbocca and sorrentino...everything in the dining room has an updated look, modern and clean lines. (We loved the original though. Including the clarinet and accordion) One thing has not changed; the portions; quality and taste consistent with the last 30 years of dining experiences at the Vineyard. DiMatteo family soooo glad to have you back! Been the the previous Vineyard many many times over the years. Newly reopened Vineyard has same menu and excellent food. I do miss the ambiance of before. The new decor is not as warm (it’s a little industrial), the lights are brighter, and the noise level is much higher. Not quite as quiet and relaxing as it used to be. Will go back for the amazing food and service. Amazing italian food. Great service friendly staff. Love the new decor. What’s not to say, food is always spectacular. I went with the special, crab/lobster ravioli. 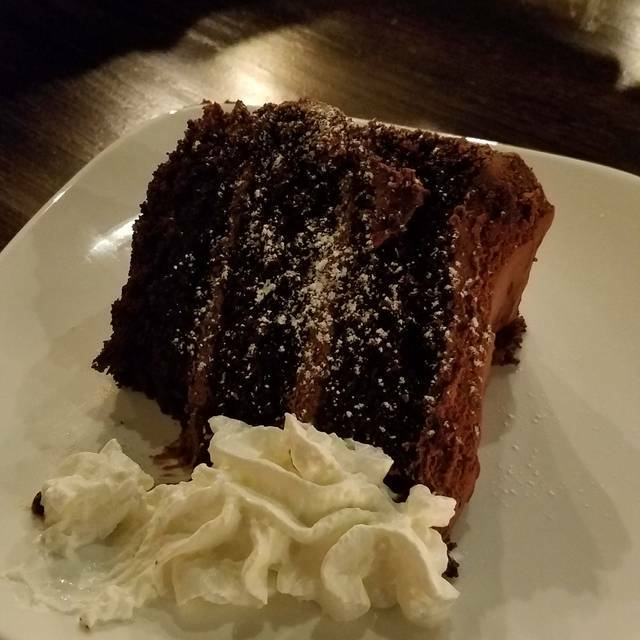 It was rich and delicious. Other plates were chicken piccata, cheese ravioli and rigatoni. All were wonderful. Staff is always fun and polite. Just a wonderful experience. We had so enjoyed our dinner at the Vineyard in January for my husband's birthday that we jumped at the chance to go back with friends this week. We all had a great time. 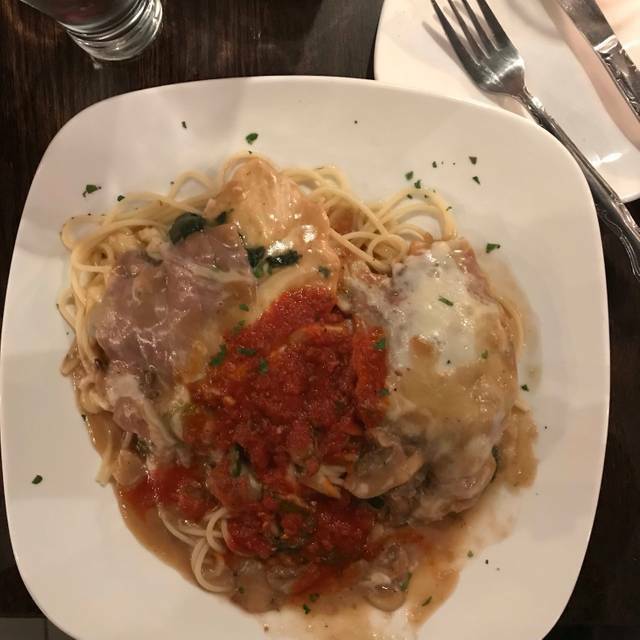 The other couple enjoyed their veal parmigiana dinners and we couldn't resist the chicken saltimbocca again and were not disappointed. The portions were generous and we both had leftovers to enjoy the next day. Food was amazing. Decor was stark and lighting was really bright. I’d love to see a more cozy, old world Italian, neighborhood look. Table cloths might help with the noise. Very good authentic Italian food. Great selections to choose from, fresh, and very tasty. First time back since the remodel and the food was fantastic as always! We had the mozzarella en carozza, ziti bolognese, chicken piccata and cannoli for dessert. Everything was delicious! The bolognese might be the best I’ve ever had. There is a small parking lot, but most of the parking is on the street, so allow yourself additional time to find parking. My husband and i went out for the first time after having our son a year ago! Bill, our server, was amazing. The food was spot on! Glad you are back - great food as usual & drinks. New decor looks amazing. Two small suggestions - the font size on menus is difficult to read ( too small) but new menu style is lovely. Second, some nice back ground music would be great. Never disappointed at the Vineyard. The Chicken Parmesan is so tender I can cut it with a fork. Pasta sauce is perfect. Service is always excellent and menu choices are varied enough to try something new each time. So glad The Vineyard has reopened and still offers the Italian dishes we've enjoyed in the past. 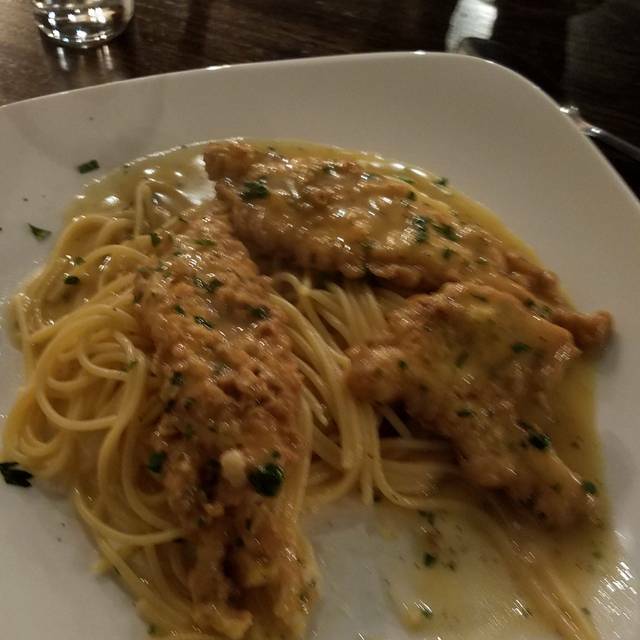 The chicken saltimbocca was a treat although we had thought the pasta with marinara sauce would be served on the side as it had in prior years, but our waitress was quick to bring a bowl of the sauce for the table when we asked. We just had to order cannoli for dessert and a double espresso [of course] for each of us. The meal was a great way to celebrate my husband's birthday and we plan to come back again. Food is delicious! Can recommend any veal dish. Salads and appetizers are very good. Mozzarella is made inhouse. Must try Italian restaurant. An outstanding traditional Italian Restaurante. All freshly made and a wide selection of salads, pastas, chicken, and veal. Our table had chopping, sea bass, cavatelli, and veal saltimbocca. They have a full bar and a very wide selection of Italian wines at a fair price. They have been around for years and it always does an outstanding job. We have been dining at the Vineyard for 15 years and have always had terrific meals and excellent service. This is the only restaurant where I get veal, tender and delicious. The appetizers are wonderful and the deserts are special. The Vineyard closed for several months in 2018 and we suffered from a lack of excellent Italian cuisine; we were overjoyed when they re-opened. Highest rating. Traditional menu, consistent quality house CabSav very good. I could not wait for the Vineyard to reopen. It was delicious and very friendly atmosphere. The food is wonderful, just as in the past. We had the mussels and the chicken pizzaiola. This is the best Italian food in the Lehigh Valley! The decor has been modernized since the reopen. My only suggestion would be table cloths... it’s a personal thing; always classes up a restaurant. we were 4 in the main dining room upstairs..............tables too close and noise level very high. HAD TO talk loudly to friends across the table..................wine served in champagne flute.................didnt like that. Salad dressing was bland but Chicken Marsala was good and abundant. Really good garlic toast. Will return for sure. My new Italian spot when in Bethlehem. Best veal in the area. not happy with the open concept, makes it very noisy, for conversation. but do enjoy the food. The lighting in this place is horrible for an intimate night out. Ambiance is also challenging. Liked the original set up better. So happy to know that the Vineyard is back in business. Décor is "nicer" but kind of miss the old version. However, there's more room for tables upstairs now and more elbow room for diners, so I get it. Menu and food remain excellent. Seafood, chicken and veal dishes our party orders were as good as we remember. Shared a hot antipasto as an app what was terrific. One of the best restaurants in the valley. This is surely the best Italian food in the Lehigh Valley. So happy they decided to reopen.